Peter was in his nineties when he died in 2017 and had seen an industry come through the doldrums to one of its healthiest times in its history. In that period, he packed in some accolades from his peers in the industry: he was Grower of the Year for individual achievement in 1999, chair of one of the key hop selling groups, Western Quality Hops for over 30 years, and was a key chairman of the NFU hops committee between 1975 and 1982. He wrote a book about his life as a hop farmer, been interviewed on radio and television, and in 2002 was awarded an MBE in the Queen’s jubilee birthday honours. It was his research with the British low-trellis, or hedgerow hop, that possibly remains his greatest legacy. His farm at Dormington, Claston, became the main testing site for all new such varieties from the Wye Hops breeding programme. He rather enjoyed being the ‘undisputed’ king of hops, though he has been described as rather adept at calling ‘geese as swans’. Nonetheless, he witnessed a sea-change in his industry. Mechanisation was, without doubt, a game-changer, a revolution even. Hop yards across the county went from hundreds of workers to a handful. But it wasn’t all plain sailing. 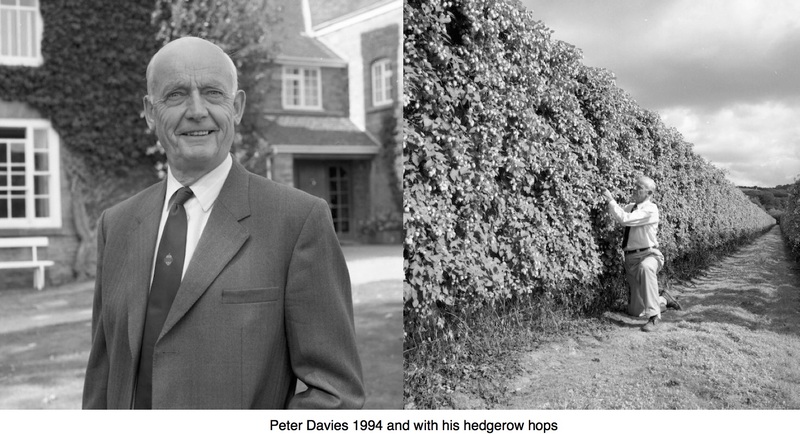 Peter: ‘We had our first hop picking machine in 1957. Father was one of the very last to have a hop picking machine. it changed the whole scene because we had 150 acres and the idea was we were going to pick half with a picking machine and the other half by hand. But you see instead of all these masses of people, you wanted only 30. But we started work at six in the morning then and worked til 11 at night. The men wouldn’t work shifts. They were terrible conditions, you couldn’t walk in the hop yard, in the headlands because there was so much mud. But anyway, mother used to serve every two hours with hot coffee, and they all stuck to it. We ended up picking I think it was 600 pockets with the machine because the pickers it was so wet they couldn’t pick. But there were a lot of faults with the picking machine. it was all too small; the belts were all three feet and the waste conveyor only 18 inches. But I was very friendly with the manufacturer and made various suggestions, widen the belt and all sorts of things, and so when we had our second hop picking machine, it was a completely different thing. It not only had four feet belts but an after feeder of four feet and the hops, when they were picked on that, they were much cleaner than any hand picking. That’s not a bad footnote to a life, is it?